as soon as it is printed! A successful direct marketing campaign running on digital media is every marketer's dream. And yet, in all the obsession and hype surrounding digital media, few people realize that media alone cannot sell products and services. This wisdom rang true in the days when newspapers and magazines first rolled of the presses, and it remains just as true today. Digital media is only a vehicle--but it cannot guarantee success by itself. It is all about the strategy that will help you say the right thing to the right person at the right time in the right place and the right way. Digital and Direct Marketing Expert German Sacristan has stepped in to help marketers in this age of digital media. He has succeeded where many have failed by writing a simple, functional, easy to reference book that will help you build a very powerful marketing communication methodical process to increase your chances of a better ROMI, or return on market investment. German knows that most marketing campaigns fail because the fundamentals are just not given the attention they deserve. In his book, he reiterates the fundamentals of marketing, sales and communication and lucidly shows how they apply in the world of digital media. Want a branded edition of The Digital & Direct Marketing Goose for your company? Digital media and marketing expert German Sacristan offers a wealth of international sales, marketing and business development experience. He has proven ability to grow market share from 26% to 80% and has successfully launched direct marketing campaigns achieving double-digit response rates. Highly passionate about sales and marketing, German was introduced to both at an early age, creating television commercials and helping customers hands-on at his family’s businesses. German values the basics and fundamentals of face-to-face marketing and enjoys using the new technologies and channels to apply those fundamentals in today’s market place. 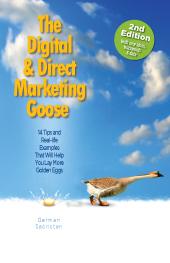 Digital and Direct Marketing Goose is a clear and pertinent elucidation of his wisdom and experience.